Blichmann Engineering has done it again! 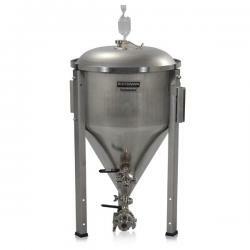 Their line of Fermenator conical stainless steel fermentors are the pinnacle of form and function for today's homebrewer. This is the 42 gallon tri-clamp model, which comes complete with tri-clamp fittings. These fittings for the bottom dump and racking arm offer unparalleled cleaning and sanitation advantages over its NPT brother. The tri-clamps can be broken down and taken apart with ease, as the seals are made via o-rings, not threaded joints. No need to wrap and rewrap with pipe thread! Blichmann takes pride in using only 304 stainless steel, and the interior all-weldless construction can't be found anywhere else on the market today! 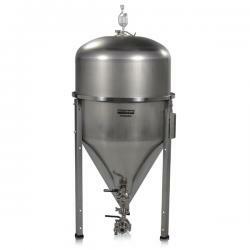 Perfect for: Up to 33 gallon finished batch sizes of beer, wine, cider, or any other fermented beverage! Minimum interior refrigerator dimensions: 24" x 24" x 48.75" - Note that Blichmann recommends at least 1" clearance on each side, which is not included in these dimensions, and also recommends 4 to 6" of clearance space in an upright freezer or refrigerator for using the lid hatch. 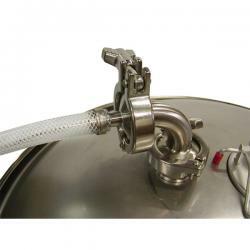 The Fermentor's stainless steel design is perfect for cleaning and sanitation! Get the sanitary edge on scratchable plastics and breakable glass by going with one of these stainless steel beauties! Complete weld-free interior construction stops bacteria from finding a hiding place, so you can easily and confidently sanitize your fermentor. Bottom dump valve where trub can be dumped or your yeast harvested; something that is impossible with traditional homebrew equipment. A rotating racking arm that not only allows you take gravity samples, but also helps you to cleanly and efficiently transfer your beer into kegs or bottling equipment. The arm can be rotated with the flow of the liquid, allowing you to avoid drawing unwanted hops during racking. A pressurizable fermentor body allows for CO2 to create a pumping effect, allowing beer to be racked up to six feet above the fermentors into kegs. Never use an auto-siphon again! 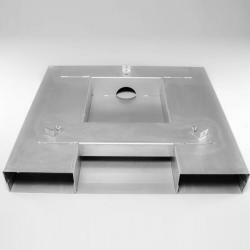 Convenient lid hatch on the top allows for ease of access to beer for adding dry hops, oak, or other flavoring agents, as well as pitching yeast. Excellent for wine fermentation too! 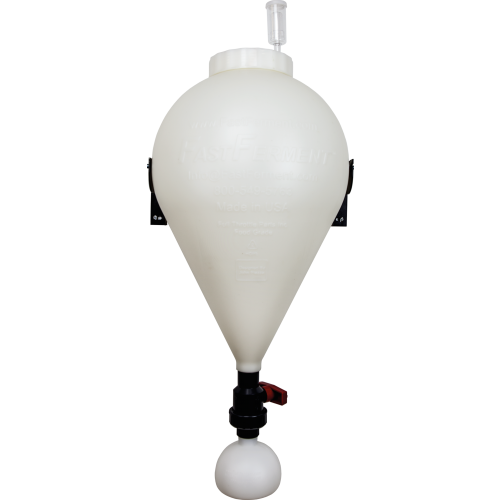 The Fermenator is superior to many variable capacity fermentors available to home vintners due to its seals and its quality of being completely impervious to oxygen. While variable capacity fermentors rely on a tube and bicycle pump design for secondary fermentation which can lose pressure over time, Blichmann's patented design keeps fermenting wine free of oxygen and the possibility of bacterial contaminants. Bolted leg construction ensures sturdiness, even when full of your delicious beer! A beaded seal on the fermentor lid ensures an extra layer of protection from depressurization, creating a superior seal on the fermentor body. 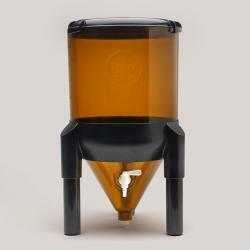 Folding handles allow easy movement of empty fermentors. Leg pads ensure safe movement without scratching of equipment and surfaces. Blichmann Engineering has done it again! 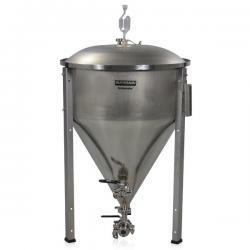 Their line of Fermenator conical stainless steel fermentors are the pinnacle of form and function for today's homebrewer. This is the 14 gallon tri-clamp model, which comes complete with tri-clamp fittings. These fittings for the bottom dump and racking arm offer unparalleled cleaning and sanitation advantages over its NPT brother. The tri-clamps can be broken down and taken apart with ease, as the seals are made via o-rings, not threaded joints. No need to wrap and rewrap with pipe thread! Blichmann takes pride in using only 304 stainless steel, and the interior all-weldless construction can't be found anywhere else on the market today! 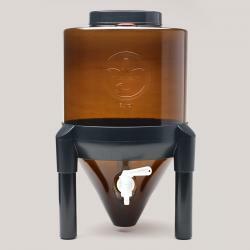 Perfect for: Up to 11 gallon finished batch sizes of beer, or 12 gallons of wine, cider, or any other fermented beverage! Minimum interior refrigerator dimensions: 18.5" x 18.5" x 31.25" - Note that Blichmann recommends at least 1" clearance on each side, which is not included in these dimensions, and also recommends 4 to 6" of clearance space in an upright freezer or refrigerator for using the lid hatch. Blichmann Engineering has done it again! Their line of Fermenator conical stainless steel fermentors are the pinnacle of form and function for today's homebrewer. This is the 27 gallon tri-clamp model, which comes complete with tri-clamp fittings. These fittings for the bottom dump and racking arm offer unparalleled cleaning and sanitation advantages over its NPT brother. The tri-clamps can be broken down and taken apart with ease, as the seals are made via o-rings, not threaded joints. No need to wrap and rewrap with pipe thread! Blichmann takes pride in using only 304 stainless steel, and the interior all-weldless construction can't be found anywhere else on the market today! 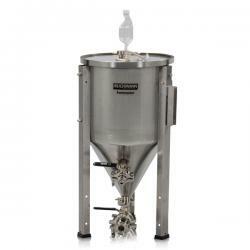 Perfect for: Up to 21 gallon finished batch sizes of beer, wine, cider, or any other fermented beverage! Minimum interior refrigerator dimensions: 24" x 24" x 35.75" - Note that Blichmann recommends at least 1" clearance on each side, which is not included in these dimensions, and also recommends 4 to 6" of clearance space in an upright freezer or refrigerator for using the lid hatch. Blichmann Engineering has done it again! Their line of Fermenator conical stainless steel fermentors are the pinnacle of form and function for today's homebrewer. This is the 7 gallon tri-clamp model, which comes complete with tri-clamp fittings. These fittings for the bottom dump and racking arm offer unparalleled cleaning and sanitation advantages over its NPT brother. The tri-clamps can be broken down and taken apart with ease, as the seals are made via o-rings, not threaded joints. No need to wrap and rewrap with pipe thread! Blichmann takes pride in using only 304 stainless steel, and the interior all-weldless construction can't be found anywhere else on the market today! Perfect for: Perfect for: Up to 5.5 gallon finished batch sizes of beer, or 6 gallons of wine, cider, or any other fermented beverage! Minimum interior refrigerator dimensions: 15" x 15" x 27" - Note that Blichmann recommends at least 1" clearance on each side, which is not included in these dimensions, and also recommends 4 to 6" of clearance space in an upright freezer or refrigerator for using the lid hatch. Blichmann Engineering thinks of everything! The Fermenator Pallet is a stainless steel pallet developed by Blichmann for their larger Fermenator fermenters. It can accomodate 27, 43, 63 and 80 gallon Fermenators. The pallet makes and excellent, solid stand for the Fermenators, allowing the Fermenators to be moved with a fork truck or pallet jack. These pallets can be moved, even with a full Fermenator on top! A worthwhile investment for someone with large Blichmann Therminators that need to be moved around! Perform primary and secondary fermentation in the same vessel. 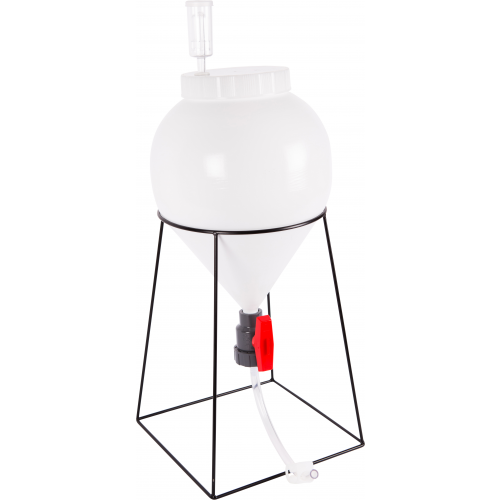 A small FastFerment Fermenter, perfect for 1 or 2 gallon batches of wine or beer. Allows you to rack directly into your bottles or keg, from the fermenter. Wide lid allows for easy cleanup.